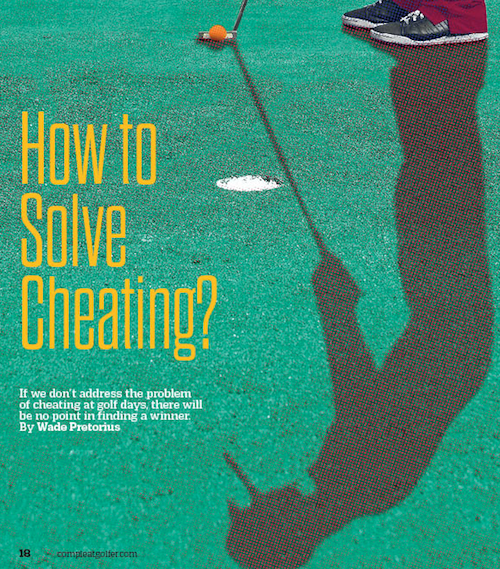 If we don’t address the problem of cheating at golf days, there will be no point in finding a winner. Spoiler alert: there’s no real solution. Sorry to disappoint, but as long as there is a human element to scoring in golf, there will be those who defy the game’s intrinsic values of honesty, fairness and trust and, to put it bluntly, ‘cook the books’ to be able to claim prizes ranging from meat hampers and the legendary toaster to a fancy cart bag or even a trip abroad. With the issue perpetually a topic of conversation, a recent tweet suggested that certain parts of the country should ramp up their creative arithmetic better than all the others while the solution to the problem continues to go unsolved. Fancy that: you are playing out of town and now your standard cheating methods are only good enough to get you third or fourth place! You’ve heard it all before (but then, there are times when even a long-time club member will be left shocked) – ex-pros playing off something higher than scratch, 18-handicappers ‘having the round of their lives’ and coming in with a nett 62 to match the other three mid-60s rounds, etc, etc. Has anyone ever thought about scrapping prizes altogether? We could play golf as it was intended to be: to shoot the lowest possible scoreor to have as much fun as possible. No tantalising carrot is left dangling to write down any number other than the one achieved. What follows is that instead of getting booed by those sticking around for the prize giving, you are free to celebrate whatever score or achievement you actually managed. There would be an outcry in some circles if you removed the glamorous prizes on offer for those ‘topping’ the field, but surely the scores would be more realistic? If there are no prizes, it renders cheating meaningless. There’s also the option of taking the value of the prizes on offer and redistributing them into the goodie bags at the start of the day to give the entire field bang for their buck. A lucky draw for a few prizes would add more fun to the post-round activities than golfers waiting to see just how low down in the field they finished, despite their excellent round and dove-tailing. The truth is, there is a kaleidoscope of issues facing this particular aspect of the game. Cheating is rampant but it doesn’t stop at writing down false scores; people playing by their own rules and padding their handicaps are two of the biggest issues. But why is the problem of fellow fourball members not calling out those who infringe the rules not being addressed? I’ve been guilty in the past of letting a few dodgy drops or abuse of local rules slide, but if we as golfers don’t stand up against all the little bits of cheating, the game is only going to suffer. It could get to a point where those sponsoring prizes stop being so generous because of the negative association with the ‘winners’. Another possible solution is to make the teams a mystery with golfers playing individually in their fourballs – you’ll still get the same internal games we all love – but then the prizes are split throughout the field in randomly assigned teams. Golf needs those who play the game on a regular basis to help restore the game to its once lofty heights. That, or you simply don’t pay the competition fee? – This article first appeared in the September issue of Compleat Golfer, now on sale!